Only a couple of miles from the lively resort of Faliraki, Afandou holidays offer the best of both worlds. You can enjoy tranquil days in this relaxed centre and then head towards your noisy neighbour, or Rhodes town itself, where you can party into the early hours. In centuries past, the coastal villages became weary of attacks from invaders and pirates so the population moved inland to areas where they could better protect themselves. Afandou was just such a village, and is now a short distance inland, hidden from the sea. If it's a seaside holiday you are after, you'll be pleased to hear that there is a regular road train taking visitors from the town to its sand and shingle beach. Located on the east of the island, this fair sized village provides excellent accommodation, superb restaurants, and a good number of shops. If shopping is your passion, you may need to take the local bus to Rhodes Town where the choice is immense. Goods carved from olive wood, local pottery and handicrafts make great gifts and souvenirs. With high standards of accommodation and service, cheap Afandou holidays are sure to please. They attract all generations as the area has so much to offer. Apart from water sports, you are close to Rhodes's only golf course. Whatever you fancy eating, be it international cuisine or local fare, Afandou's restaurants will satisfy your needs. It is no surprise that fish is a regular feature on menus. Fresh from the sea and deliciously cooked, you are in for a treat. If you are looking for lively nights, head for Faliraki or the principle town, as Afandou is as relaxed by night as it is by day. From early spring to late autumn, cheap Afandou holidays promise long hours of daily sunshine. 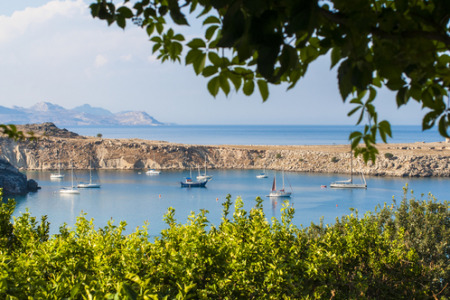 If you've never been to the east coast of Rhodes, and you fancy a cheap Afandou holiday but find the thought of trawling through web page after web page looking for the best deal more than a little off-putting, try our simple search facility. You'll find over three dozen travel companies, including leading brands, competing for your custom. It is simple to use, and remember, competition brings out the best bargains. Our search facility enables you to see, at a glance, the Afandou holiday that is the cheapest, and the one that offers the best value for money. It couldn't be easier. All you have to do to secure the holiday is make a phone call. As offers change daily, in order to avoid disappointment, you should ring today.